A 4-year-old, 1.8 kg, male, castrated Maltese was presented for evaluation of urolithiasis. Urinary calculi were composed of ammonium biurate. Preprandial and postprandial bile acids were 44.2 and 187.3 µmol/ℓ , respectively (reference ranges 0-10 and 0-20 µmol/ℓ , respectively). Single-phase contrast-enhanced computed tomography angiography (CTA) with volume-rendered imaging (VRI) was obtained. VRI revealed a portocaval shunt originating just cranial to a tributary of the gastroduodenal vein and draining into the caudal vena cava at the level of the epiploic foramen. CTA revealed a 3.66 mm-diameter shunt measured at the level of the termination of the shunt and a 3.79 mm-diameter portal vein measured at the level between the origin of the shunt and the porta of the liver. Surgery was performed using cellophane banding without attenuation. Follow-up single-phase CTA with VRI was obtained 10 weeks after surgery. VRI revealed no evidence of portosystemic communication on the level of a cellophane band and caudal to the cellophane band. CTA demonstrated an increased portal vein diameter (3.79-5.27 mm) measured at the level between the origin of the shunt and the porta of the liver. Preprandial and postprandial bile acids were 25 and 12.5 µmol/ℓ, respectively (aforementioned respective reference ranges), 3 months post-surgery. No problems were evident at 6 months. Keywords: cellophane banding, contrast-enhanced computed tomography angiography, extrahepatic portosystemic shunt, volume-rendered imaging. Portosystemic shunts are anomalous vessels that join the portal and systemic venous circulation, allowing most of the portal blood to bypass the liver and enter the systemic circulation and are classified as intrahepatic or extrahepatic2,13,17. Portosystemic shunting occurs either as a single congenital shunt or as multiple acquired shunts due to chronic portal hypertension11. Radiographic angiography2,15, scintigraphy19, sonography4, computed tomography angiography (CTA)1,7,25, and magnetic resonance angiography3 have been used to characterise portosystemic shunts in dogs. The recent development of computed tomographic equipment and imaging software has permitted the acquisition of highly accurate images of the portal system5,19,26. Presently available surgical options include complete ligation with suture materials, ameroid ring constrictor placement and cellophane banding11,14,18,22. A surgical technique using cellophane bands for treatment of extrahepatic portosystemic shunts has been described6, but the results concerning the degree of occlusion after cellophane band placement have not been reported. This case report describes the use of cellophane banding using pre-and postoperative contrast-enhanced CTA and volume-rendered imaging (VRI) in a dog. A 4-year-old, 1.8 kg, male, castrated Maltese was presented to the VIP Animal Hospital for evaluation of urolithiasis. The owner reported small body stature and urinary calculi. The urinary calculi were submitted for quantitative mineral analysis, which revealed an ammonium biurate composition. Abdominal radiographs revealed microhepatica. Low serum albumin (2.7 g/dℓ ; reference range 3.1-4.1 g/dℓ ), high glucose (172 mg/dℓ ; reference range 60-120 mg/dℓ ), and high alanine aminotransferase (73 U/ℓ; reference range 3-50 U/ℓ) were identified on serum biochemical profiling. Measurement of bile acid concentrations revealed elevated levels of preprandial and postprandial bile acids (Table 1). CTA was performed a day after the specialised biochemical test to identify the origin and termination of a shunt vessel. The patient was premedicated with glycopyrrolate (Tabinul inj; Hana Pharm, Korea; 0.01 mg/kg, IM) and acepromazine (Sedaject inj; Samu Median, Korea; 0.05 mg/kg, IM), followed by anaesthetic induction with propofol (Provive inj; Claris Lifesciences, India; 6 mg/kg, IV). The patient was intubated and anaesthesia was maintained with isoflurane (Ifran; Hana Pharm, Korea) and oxygen. Normal saline was administered intravenously at a rate of 5 m /kg/h until completion of the CTA procedure. The patient was imaged in dorsal recumbency and underwent a routine helical CT scan of the whole body (from the level of the thoracic inlet to the coxofemoral joint) using an Asteion 4 multi-detector CT device (Toshiba, Japan), followed by an angiographic whole-body scan. The scanning parameters were slice thickness of 1 mm, beam pitch of 1, 120 mA, and 150 KVp. Single-phase CTA with VRI was obtained, and involved acquiring a portal phase as the contrast medium reached the portal vein following a single injection. A dosage of 850 mgI/kg of iohexol (Iohexol 350 Omnipaque; Amersham Health, USA) was injected IV at a rate of 1m /sec with a maximum pressure of 42.66 lb/in2 using an Angiomat 3000 angiographic injector (Liebel Flarsheim, USA). For imaging of the portal vein, helical scanning was begun 50 s after the start of contrast medium injection. No bolus tracking technique was performed. 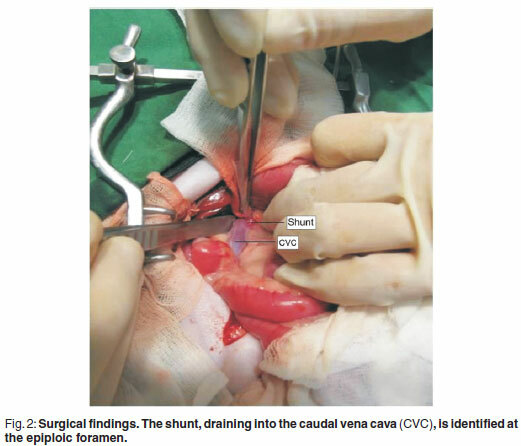 VRI demonstrated that a portocaval shunt originated just cranial to a tributary of the gastroduodenal vein and drained into the caudal vena cava at the level of the epiploic foramen (Fig. 1a). CTA revealed a 3.66 mm-diameter shunt measured at the level of the termination of the shunt (Fig. 1b), and a 3.79 mm-diameter portal vein measured at the level between the origin of the shunt and the porta of the liver (Fig. 1c). Nephroliths and cystoliths were identified by CT scan. A diagnosis of extrahepatic portocaval shunt with nephroliths and cystoliths was made. Surgical correction was performed the week following admission. Preoperative therapy included low-protein diet, lactulose (Duphalac; Choongwae Pharm, Korea; 1.5 mℓ, PO, tid) and metronidazole (Flasinyl CJ tab; CJ Cheil Jedang, Korea; 10 mg/kg, PO, tid). The patient received cefazolin (Cefazoline inj; Chongkundang Pharm, Korea; 20 mg/kg, IV) at the time of anaesthetic induction. The patient was positioned in dorsal recumbency. A ventral midline incision was made from the xiphoid process to the pubis. Abdominal exploration was within normal limits except for the portocaval shunt. The mesoduodenum was retracted to the left to approach the epiploic foramen. The shunt, originating from the portal vein and draining into the caudal vena cava, was identified at the epiploic foramen (Fig. 2). Agreement between CTA imaging and surgical findings was found. The shunt was isolated by means of blunt dissection for placement of a cellophane band. An ethylene oxide-sterilised cellophane band formed by folding 1.5 cmwide strip in thirds longitudinally was passed around the shunt. The cellophane band was secured using a hemoclip and 3-0 nylon (Nylon®; Namhae Chemical, Korea) without attenuation. No changes in heart rate, intestinal colour and motility and pancreatic color were identified. Cystotomy was performed to remove cystoliths. The linea albawas was closed using 3-0 polyglycolic acid (Dexon II®; Covidien Animal Health and Dental Division, USA) in a simple continuous pattern. The subcutaneous tissues and skin were closed using 4-0 polyglycolic acid and 3-0 nylon, respectively. The patient was given tramadol (Tridol; Yuhan, Korea; 2 mg/kg, PO) for pain. A low-protein diet, lactulose (1.5 mℓ , PO, tid), and metronidazole (10 mg/kg, PO, tid) were prescribed. Preprandial and postprandial bile acids levels were still elevated 2 months after surgery (Table 1). The aforementioned CT procedures were repeated 10 weeks after surgery. A cellophane band was identified on both routine and CTA images. The Hounsfield units of the cellophane band was 3028.60. VRI revealed no evidence of portosystemic communication on the level of a cellophane band and caudal to the cellophane band (Fig. 3a). 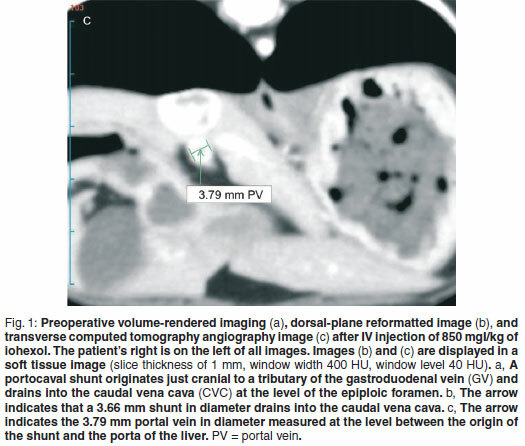 CTA demonstrated an increased portal vein diameter of 3.79 to 5.27 mm, measured at the level between the origin of the shunt and the porta of the liver (Fig. 3b). The preprandial bile acid level was close to the reference range and the postprandial bile acid level was within the reference range 3 months after surgery (Table 1). When contacted 6 months after surgery, the owner reported that the dog was doing well. One of the most commonly used methods for treatment of portosystemic shunts is cellophane banding6. This technique stimulates perivascular fibrosis and leads to gradual vascular occlusion11,20.The other commonly used method is the use of an ameroid ring constrictor16. In this technique, gradual attenuation occurs as casein slowly absorbs body fluid21. Despite the benefits associated with the use of an ameroid ring constrictor compared with cellophane banding, acute kinking of the shunt vessel after ameroid ring constrictor placement could account for increased morbidity and mortality rates in a manner similar to acute suture ligation of the shunt vessel, especially in smaller patients14. In view of the complications such as portal hypertension and perioperative seizures associated with attenuation of portosystemic shunts, the best surgical treatment should produce gradual and complete shunt attenuation, which would allow more time for the cardiovascular and nervous systems to adapt to changes in portal blood flow. In the present case no evidence of portosystemic communication was noted on VRI and multiplanar reformatted images 10 weeks after surgery. Furthermore, the authors could find no published data demonstrating complete attenuation of portosystemic shunt using VRI. When portal blood is diverted away from the liver and into a systemic vein, the liver is deprived of hepatotrophic substances, such as insulin and glucagon, and the systemic circulation is exposed to unmetabolised intestinal toxins9,24. The aim of surgical treatment is to redirect portal blood through the liver. In the present case, increased portal vein diameter was demonstrated by CTA, concurrent with no evidence of clinical signs relative to portal hypertension. Increased portal vein diameter with no evidence of clinical signs relative to portal hypertension might make an accurate estimate of return to normal hepatic structure and function without using a mesenteric portovenogram. As for the degree of attenuation, longterm prognosis for dogs in which the shunting vessel is able to be completely attenuated is excellent10, while 1 study has shown that up to 50% of dogs with partial attenuation exhibit recurrence of clinical signs12. One study documented that complete shunt occlusion is less likely to occur when cellophane banding width is greater than 3mm24. In the present case, a 3.66 mm shunt in diameter was completely occluded without intraoperative attenuation 10 weeks after surgery and there was no evidence of recurrence of clinical signs 6 months after surgery. This finding was similar to that obtained in a previous study8. In this study, the non-attenuated group showed better prognosis than attenuation to a diameter <3.0 mm. The development of various diagnostic techniques allows accurate detection of portosystemic shunts; however, diagnosis of congenital portosystemic shunts remains challenging. The ideal technique would be minimally invasive, inexpensive and would yield results rapidly and accurately. In addition, shunt location should be determined to avoid intraoperative mesenteric portography that is invasive and requires a prolonged episode of general anaesthesia. 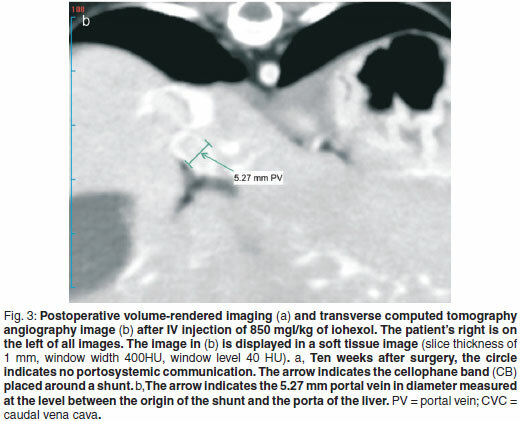 In the present case, use of CTA and VRI allowed highly accurate images of the portal system, which led to the determination of shunt location and decreased surgical and anaesthetic times. Assessment of postprandial serum bile acid concentrations is performed to evaluate the outcome of patients surgically treated for portosystemic shunt23.Inthe present case, cellophane banding was performed without intraoperative attenuation and postprandial serum bile acid concentration was within reference limits 3 months after surgery. Two studies documented that complete and partial ligations of portosystemic shunt might put patients at higher risk for developing chronic subclinical portal hypertension and acquired shunts8,23. In these studies, postprandial serum bile acid concentrations increased over time in some dogs with partial attenuation. Cellophane banding without intraoperative attenuation results in slow and gradual decrease of bile acid concentration. One study reported that postprandial serum bile acid concentration decreased 6 months after cellophane banding in dogs without intraoperative attenuation8, whereas in the present case postprandial serum bile acid concentration was within reference limits 3 months after surgery. It is possible that a shunt that is larger in diameter than the shunt reported here could result in slow decrease of bile acid concentration, and would be a plausible explanation for the rapid return to the reference limits documented here. A study of postprandial bile acid concentration depending on shunt size is warranted to better predict the outcome of patients surgically treated for portosystemic shunt. This work was supported by a National Research Foundation of Korea grant funded by the Korean Government (NRF-2009-353-E00034).